When normal government work period is interrupted by power outage, what should employees do? d) make use of your government hours somehow around your office then go home at regular clock out time -- be resourceful! Which category have you been applying? Like today, Friday, the power went out around 2-ish and didn't come back until around 5:30. What did you do? Power scheduling is no stranger. Video of President Mori giving the State of the Nation Address on May 29, 2013. President Manny Mori gave his State of the Nation address yesterday at the FSM Congress chamber. Here is the full text of the speech in the link below. President Manny Mori during delivery of the State of the Nation Address on the 19th day of the first regular session of the 18th FSM Congress. Listening from the backside: Speaker Dohsis Halbert, top, Mrs. Liwiana Ramon-Ioanis, rigth, Chief Clerk; Mr. Lam Tan, Legal Counsel; Mr. Andy Andrew, Journal Clerk. From top: Floor Leader Singkoro Harper, Senator Joseph J. Urusemal, Senator Vicky Gouland, Senator David W. Panuelo, Senator Isaac V. Figir, Senator Bonsiano Fasy Nethon, and partly shown, Senator Tiwiter Aritos. Members of the Diplomatic Corp at front seats; Our Lady of Mercy Church Chuukese choir members at back seats. Fr. Julio Angkel, Vicar of Pohnpei and Kosrae Vicariate of the Catholic Church, leading the prayer reflection before the President gave the State of the Nation address. Lt. Governor Marcelo Peterson, top right, Chief of Staff Leo Falcam Jr., bottom right, Secretary Lorin Robert, bottom left, NORMA Executive Director Mr. Patrick McKenzie, Ambassador to China Akilino Susaia, center, and two other National Government Officials. Staff members of the Office of Environment and Emergency Management and the Department of Justice. Cabinet, Staff members and other Heads of agences and institutions.. The full text of the President's message will be linked here once uploading process is complete. In line with bidding requirements, specifically for the construction of the FSM Post Office in Kosrae, the links below will show materials that have been posted on the FSM Information Office website for public view. FSMIS (May 23, 2013): A day for President Manny Mori is to deliver the State of the Nation address to Congress and the rest of the Nation, Speaker Dohsis Halbert assembles the technical staff from Congress Office and the President's Office to jointly put in the last "set up" details. For starters, the address will be preceded by a song from the Our Lady of Mercy Church International Group and a scripture reflection by Fr. Julio Angkel, Vicar of the Vicariate of Pohnpei and Kosrea in the Catholic Church. The final planers include Congress Office Administrator, Mr. Suda S. Rayel, Mr. Lam Tang, Legal Counsel, Mrs. Liwiana Ramon Ioanis, Chief Clerk, and the Congress PIO staff: Dayston Roby and Andy Choor. Senator David W. Panuelo offers valuable inputs from Members' view, along with the Speaker himself. Chief of Staff, Mr. Leo Falcam Jr. leads the crew from the President's Office involving Mr. Pelsasar Petrus, Special Assistant to the President on Administrative Affairs and Marcellus J. Akapito, Special Assistant to the President on Public Information. Arrangement have been made to have live radio broadcast of the President's address throughout the FSM with assistance from FSM Telecom and two radio stations in Pohnpei. Telecom also has the capacity to stream such broadcast through the Internet for net users. Including a biblical reflection and having songs to accompany the State of the Nation address is a new creative arrangement in the program. President Manny Mori received a courtesy call by Rear Admiral Tilghman Payne earlier today after the Memorial Day event, honoring Micronesia's fallen heroes who served in the U.S. Armed Forces. Rear Admiral Payne is Commander, U.S. Defense Representative for Guam, CNMI, FSM and Palau. Through coordination under the FSM Department of Foreign, with assistance from the US Embassy in Pohnpei, a Memorial Day solemn ceremony took place at the Pohnpei International Airport remembering FSM's fallen heroes. Nine photos of FSM citizens who died serving in the US Armed Forces have been on display at the airport for over a year. The parents of the late Sergeant Sapuro B. Nena unveiled the newest addition to the photo display, making total of ten. An official release from the department will be forthcoming. RDML Tilgham Payne, Commander, U.S. Defense Representative Guam/CNMI/FSM/Palau was also at the Memorial Day gathering. A view of the Memorial Day gathering from the side of the arrival section of the Pohnpei International Airport. 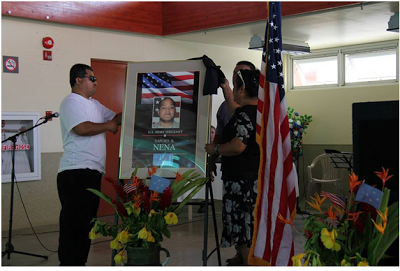 A handful of citizens were there to join families of the fallen heroes, whose wall pictures are visible here, in remembering and paying respect to the high sacrifice made by these ten beloved Micronesians. Dept. of Resources & Development (May 27, 2013): The 6th FSM State and National Leadership Conference (SNLC) that took place on May 10th endorsed the recommendations arising from the Symposium on investment facilitation in the FSM, which was held on May 06-09, 2013 at the COM-FSM Gymnasium. States and National Leaders noted with concern the areas of ease of doing business where the FSM needs to exert more efforts to enhance all-around business climate. These areas include the protection of investors, registration of properties, enforcing contracts, and starting a business. State and National Leaders also noted the critical need to support the local private sector with a view to enhance its capacity to produce competitive goods for both domestic and overseas markets, in line with the National Export Strategy adopted in December 2012 by the National Trade Facilitation Committee (NTFC). After thorough review, the State and National Leaders adopted a number of recommendations formulated at the Symposium, in particular, the harmonization of substantive issues in foreign investment regimes across the four States; the development of time standards for State Courts based on the FSM Supreme Court model; the establishment of a one window shop for required documentation processes; the creation of an Investment Promotion Agency within the FSM Department of R&D to handle foreign investment; and the streamlining of the approval process of foreign investment in line with the current 7-day policy for registration of corporations. In addition, the SNLC considered the need for a better protection of the rich and diversified cumulative body of knowledge, know-how, practices and representations developed and maintained by the people of FSM in interacting with the natural environment throughout history. In the same view, local products which correspond to the FSM and its four States as specific geographical locations or origins also need property rights protection. In this regard, the SNLC adopted a resolution calling for the development of a comprehensive Intellectual Property Right (IPRs) regime in the FSM to safeguard ownership rights over the traditional knowledge, genetic resources and local products originating from entities within the FSM. The Symposium was part of a number of on-going initiatives towards right-sizing the public sector, nurturing private sector growth and enhancing investment activities for the overall objective of progressing economic development and building financial stability. Participants to the Symposium enhanced their knowledge and understanding of investment promotion and facilitation through interacting with resource persons and learning from their presentations of experiences and lessons learned in different places. The resources persons who informed the Symposium included Ambassador George Hara, Special Adviser to the Cabinet, Office of the Prime Minister of Japan and Chairman of the Alliance Forum Foundation, Mr. Chris Kanazawa, Hawaii State Director, USDA-Rural Development, Mrs. Dianne Masih-Reddy, Senior Manager of Investment Fiji, West Regional Office, representing the Government of Fiji, Ms. Ikuko Matsumoto, Director, Urban Social Development and Public Management Division at the Asian Development Bank and her delegation, Mr. Jonathan Kirkby, Senior Investment Policy Officer, IFC-World Bank Group, and Mr. Joseph Bradley, Senior Vice-President/ Chief Economist & Business Continuity Officer, Bank of Guam. President Manny Mori opened the Symposium and, among other things, reminded the participants of the conditions under which the FSM as a whole must press on in forging an acceptable future amid looming challenges. The Symposium would contribute immensely to the FSM’s future-building endeavor. The participants at the Symposium came from State and National Governments with many others representing the private sector and non-government organizations, as well as some officials from the FSM Development Bank and the Bank of the FSM. Additionally, various members of the resident Diplomatic missions and the international organizations based in the country availed themselves throughout the Syposium. With the Leaders’ endorsement of the recommendations, an NTFC subcommittee on investment facilitation will be established to monitor and assist with implementation progress. For further information, please contact the Trade and Investment Division at the FSM Department of R&D at (691) 320-5133 or fsmrd@fsmrd.fm. FSMIS (May 27, 2013): The FSM Household Income and Expenditure Survey will be conducted in all the States for a period of one-year, beginning July 11, 2013. “Unlike the HIES conducted in 2005 where it was carried out over three weeks, this 2013 HIES will be conducted over a period of one year. The main purpose for extending the survey period to one year is to enable capturing of seasonal expenditure. This will provide a more accurate picture of living standard in the FSM”, President Mori states in his May 23 letters to the State Governors. Apart from revealing income and expenditure distribution, the survey will provide information on home production activities for both goods and services; nutritional and food consumption patterns; up-to-date data for poverty analysis of FSM households; Consumer Price Index (CPI) re-basing to be comparable with other Insular Areas; and progress in other commitments such as the Millennium Development Goals (MDGs). President Mori seeks the support of the Governors in ensuring their people’s cooperation in bringing about a successful survey for everyone’s benefit. For further information, contact Mr. Mathew Chigiyal, Assistant Director for Statistics at the Office of SBOC at 320-2823 or the Manager of the Pohnpei Branch Statistics Office at 320-6590. FSMIS (May 27, 2013): President Manny Mori has acknowledged with appreciation Congress’ flexibility in allowing him to present the State of the Nation message during this first regular session of the new Congress. Join efforts by staff from both branches will be mobilized to ensure the general public is provided with live radio broadcast of the President’s address. Broadcasts of all the public stations throughout the country are streamed to the internet through FSM Telecom’s http://www.fm/radio.htm for listeners abroad. For inquiries, call 320-2548 - email fsmpio@mail.fm or markapito@gmail.com . Most senior Member of Congress would like "more transparency"
FSMIS (May 24, 2013): During the course of budget hearing today for the three components of the FSM Office of the President, Senator Isaac V. Figir, Chairman of the Congressional Standing Committee on Ways and Means (most senior Member) noted the increase in information outputs by the FSM Public Information Office and indicated his desire that other such offices throughout the National Government follow suit in their role of informing the public. In a country where daily progressive television, press and other forms of mainstream media are yet to be adequately operational for a number of challenging factors, the public information service arms of government branches and offices are challenged to be more engaging and productive in light of the shared interest for transparency in service of the People's Right to be well informed. It must be noted here that some radio coverage on government actions are provided through the public radio stations in the states and a few private stations, such as the Baptist Radio Station in Pohnpei. In many cases, these stations simply air reports made by the personnel at the information offices. Congress deliberates on a proposed "FSM Chemical Weapons Act"
FSMIS (May 24, 2013): In today's meeting, Congress passed in first reading Congressional Bill No. 18-01 jointly assigned to the Standing Committee on Judiciary and Governmental Operation (J&GO) and the Standing Committee on External Affairs (Ex.Aff.). The bill proposes to create a new Chapter 13 in Title 11 of the Code of the Federated States of Micronesia, providing provisions for the implementation of the Chemical Weapons Convention at the national level. The FSM National Government elected to join the Chemical Weapons Convention. Your Committee thus sees the enforcement of that accord as a necessity. Passage of the legislation is a step in that direction. The FSM first elected to join the convention in 1993. Also according to the report, the FSM Department of Justice "is made the 'National Authority' on chemical weapons", permitting the Secretary of Justice to "cooperate and collaborate with foreign states, international organizations and entities, and foreign authorities" with a requirement that notifications of such cooperation be provided to the Secretary of Foreign Affairs. The text of the bill is in the link below. The 18th FSM Congress has reached the 13th day of its First Regular Session today with committee hearings well underway on the FY14 Recommended Budget submitted by President Manny Mori last month. The review of the comprehensive budget for the National Government has to be completed prior to September 30th to allow for a smooth transition into the next fiscal year and prevent breakdown of government services. For further information, visit the FSM Congress website www.fsmcongress.fm as managed by the FSM Congress Public Information Office. FSMIS (May 24, 2013): The MV Caroline Voyager, initially scheduled to leave Pohnpei yesterday on a trip to the islands in the Mortlocks and Northwest in Chuuk State, has been delayed for two days according to Secretary Francis Itimai, Department of Transportation, Communication and Infrastructure (TC&I) in a letter to President Manny Mori earlier today. The Secretary said cargo off-loading of some three thousand (3,000) copra bags purchased by the FSM Coconut Development Authority (CDA) from Yap during the ship's last voyage (arrived back in Pohnpei about a week ago) was the main reason for the decision to delay. Off-loading of CDA cargo is normally done by the Federated Shipping Company in Pohnpei. Secretary Itimai expressed confidence the off-loading work would be completed today. Apart from providing passenger and cargo service to the Mortlocks and Northwest islands, the trip will enable the deployment of some staff of the FSM National Department of Education to administer the National Competency Test to selected elementary and high school grade levels in these particular regions. For further information, contact the FSM Information Office at 320-2548 or email fsmpio@mail.fm. President Manny Mori arrived Pohnpei on May 15 after taking a few days of medical checkup in the Philippines. The President has resumed duties and is in good health conditions after availing himself with medical assistance abroad. The President is expected to report to Congress on the State of the Nation if not toward the closing of the on-going session, then during the next subsequent session. The on-going session is scheduled to adjourn on May 31, unless extended through resolution of Congress. e) elimination of persistent organic pollutant (POPs). a) Any non-government organization, community-based organization/group, or community in the FSM that is chartered OR if not chartered, have evidence of legitimacy. Full Grants are up to US$50,000 (average $20,000) for projects of 1-3 years duration (preferably 2 years). Planning Grants - proponents may apply for a grant of up to US$2,000 to use in assisting them to develop a full project proposal. This Planning Grant is subject to approval of Concept Papers. Contact the Programme Assistant (see address below) to obtain a Project Concept Format, the general criteria, and other relevant documents. Fill out the 3-page Project Concept Paper and submit to the Programme Assistant anytime. If Project Concept Paper is approved, Proponent is then asked to submit a full Proposal. We highly encourage all concept proposals to be submitted electronically as much as possible per concept format. Project Proponents can submit Project Concept Papers AT ANY TIME. Reviews of Concepts are usually done quarterly but can be more frequent depending on number of Concepts received. Project Concept Papers must be submitted WITH ALL ATTACHMENTS to the appropriate contact below before they can be reviewed. FSM Dept. of Foreign Affairs (May 22, 2013): The Mid-Year Review meeting between the Federated States of Micronesia and the United States was held in Palikir, Pohnpei on May 15, 2013, on updated issues of mutual interest relating to Title III of the Compact of Free Association. On behalf of Governor Ehsa and Pohnpei State, Lt. Governor Marcelo Peterson delivered a welcoming remark, followed by remarks delivered by FSM Ambassador to US Asterio Takesy and US Ambassador Doria Rosen. The proceedings of the meeting were facilitated by Assistant Secretary Ricky Cantero. The meeting centered on the issues or action items implemented in the 2012 Joint Committee Meeting (JCM) held in Honolulu, Hawaii. Both sides exchanged views, comments and updates for information and discussed possible ways to move forward on the assigned action items. Among the many issues discussed, there were new security issues introduced in the discussion – cyber security and climate change. Given the threats posed by these security issues, the FSM delegation proposed them to be part of the JCM process. Another issue tabled by the FSM was U.S.veteran’s benefits. The FSM delegation shared concerns relating to FSM citizens who are veterans and are not accessible to full benefits. The US side responded by indicating that there were avenues available through the Embassy to get access to Veterans Affairs but the need for an organized veterans association in the FSM and as a “strong voice” from all FSM veterans residing in the FSM were possible ways forward. Both sides provided updates and brief overviews on the action items assigned and both were scheduled to provide a more comprehensive deliberation on the action items in the annual JCM in the latter part of the year. A cocktail reception was hosted by Secretary Lorin Robert in honor of the occasion. Heading the FSM Delegation was His Excellency Asterio Takesy, Ambassador to the United States along with Mr. Francis Itimai, Secretary of Transportation, Communications and Infrastructure, Ms. April Dawn Skilling, Secretary of Justice, Mr. Marcelo Peterson, Lt. Governor of Pohnpei State and various officials from the Office of SBOC, Departments of Justice and Foreign Affairs. The US Delegation was headed by Her Excellency Ambassador Doria Rosen accompanied by Deputy Chief of Mission Miguel Ordonez, Mr. Dave DeLeo of PACOM, Mr. Roy Tsutsui of Joint Region Marianas and Ms. Lynn Pangelinan from the US Embassy.